Need somewhere new to get amazing scarves? I've found it for you - Pull & Bear. Owned by Zara, I was brought into the store in Belfast by Rebecca the Victoria Square Personal Stylist during my recent appointment with her. As well as an amazing range of coloured skinny jeans (£19.99), I was particularly taken by their accessories - especially the scarves - long & full, super soft, with gorgeous vibrant colours and all priced between £9.99 and £17.99. Here's the first one I want to show you - a gorgeous stone/blue animal print. There are a few things I look for when I'm buying a scarf. It's easy to pick them up here and there and end up not wearing them much. I always look for scarves with either white or black within the pattern. I also look for (and hadn't been successful up to now) denim colours. If, like me, you wear lots of denim, you'll find more opportunities to wear scarves with navy and blue in them. Finally, pattern wise, I avoid floral prints, finding them a bit ageing. Animal prints or prints of animals/birds are very on trend, helping to update last winter's wardrobe. Stripes or checks are also good classic patterns that will stand the test of time. So I wore my new scarf today with stone A-Wear skinny jeans (similar), a white H&M t-shirt, denim shirt (similar) and River Island ankle boots (similar). I added my Primark blue mac coat when I went out. I got this coat a few years ago but haven't worn much as I didn't have a scarf with the right shade of blue...until now that is! And while I'm on the topic of gorgeous new scarves, don't forget, I'm giving away two Marks & Spencer bird-print scarves on the blog this week. Click here to enter - it runs until the end of the week! See you tomorrow when I'll be filling you in on a great charity initiative called FrOctober. In the meantime please give the FrOctober Facebook page a like. It's going to be a fun frock-filled month! 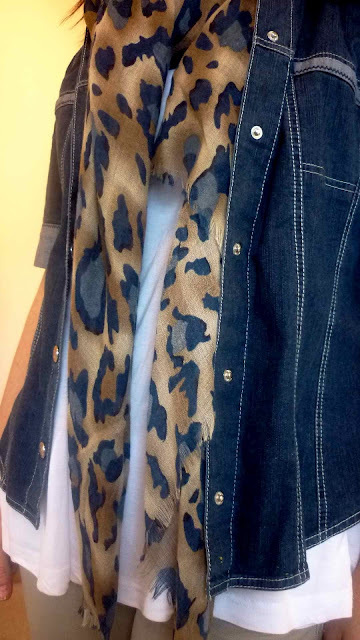 I love animal print scarf with denim jacket! To me these two are the ultimate pairing!! Casual and "wild"! Perfect! That scarf is really lovely Avril. I love that scarf and that is a colour combo that I don't have but could definitely use. I didn't know that Pull & Bear was owned by Zara. Interesting! I just bought a leopard scarf! Haha ;). It looks great and love the advice on picking the right on. Also thanks for voting for me. I can't get enough of leopard print! 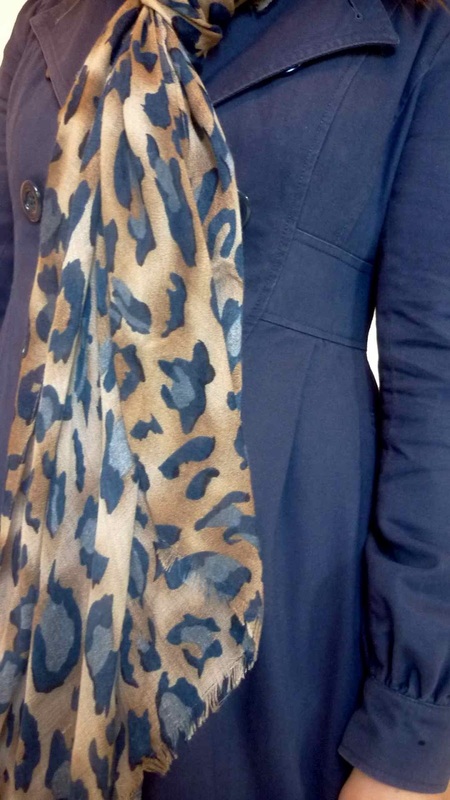 I love the stone/blue colour in this scarf :) I hadn't realised they were owned by Zara! Oh I love that scarf and do need one with blue tones... must pop into Pull & Bear for a nosey!